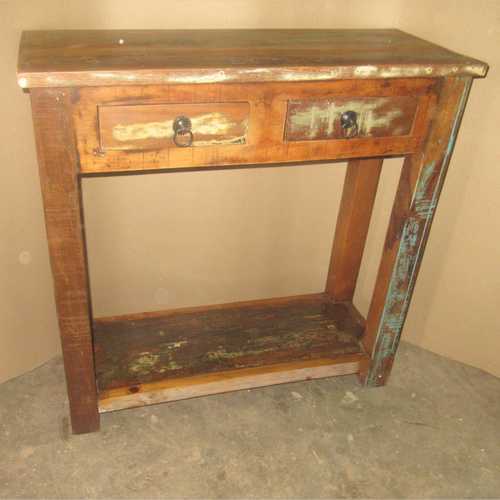 Fairly small and simple console table with two drawers, made from reclaimed wood. Simple yet practical, this narrower sideboard is perhaps useful for smaller spaces or properties. This piece has two slim drawers below a hardwood top. Four slim wooden legs are joined at the bottom by a sturdy shelf that is close to the floor. 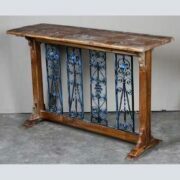 Being made from reclaimed materials, the colouring of the piece is more rustic and distressed. This sideboard has a darker colouring that is a pleasing combination of different textures and shades of natural wood grain with splashes and streaks of blue, green and turquoise paintwork. 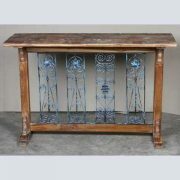 A really simple and charming piece, this compact unit would fit snugly in a landing, hallway or dining room. 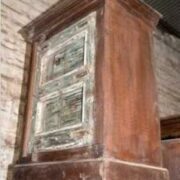 RECLAIMED INDIAN FURNITURE AND ACCESSORIES – Take a look at our blog about this style of furniture here.